Marcus Vipsanius Agrippa was a Roman consul, statesman, general and architect. 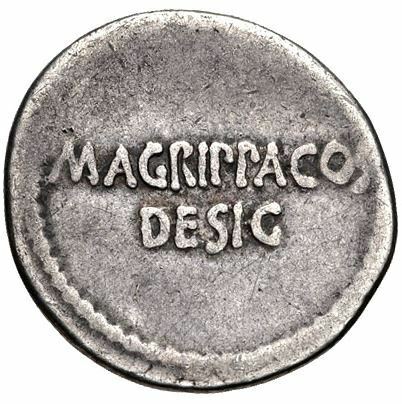 He struck an issue in 38 BC jointly with Octavian, but was also honoured posthumously during imperial times. He was a close friend, son-in-law, and lieutenant to Octavian and was responsible for the construction of some of the most notable buildings in the history of Rome and for important military victories, most notably at the Battle of Actium in 31 BC against the forces of Mark Antony and Cleopatra. As a result of these victories, Octavian became the first Roman Emperor, adopting the name of Augustus. Agrippa assisted Augustus in making Rome 'a city of marble" and renovating aqueducts to give all Romans, from every social class, access to the highest quality public services. He was responsible for the creation of many baths, porticoes and gardens, as well as the original Pantheon. Agrippa was also father-in-law to the second Emperor Tiberius, maternal grandfather to Caligula, and maternal great-grandfather to the Emperor Nero. Agrippa’s last public service was his beginning of the conquest of the upper Danube River region, which would become the Roman province of Pannonia in 13 BC. He died at Campania in 12 BC at the age of 51. Augustus personally oversaw all of Agrippa's children’s educations. Although Agrippa had built a tomb for himself, Augustus had Agrippa's remains placed in Augustus' own mausoleum.